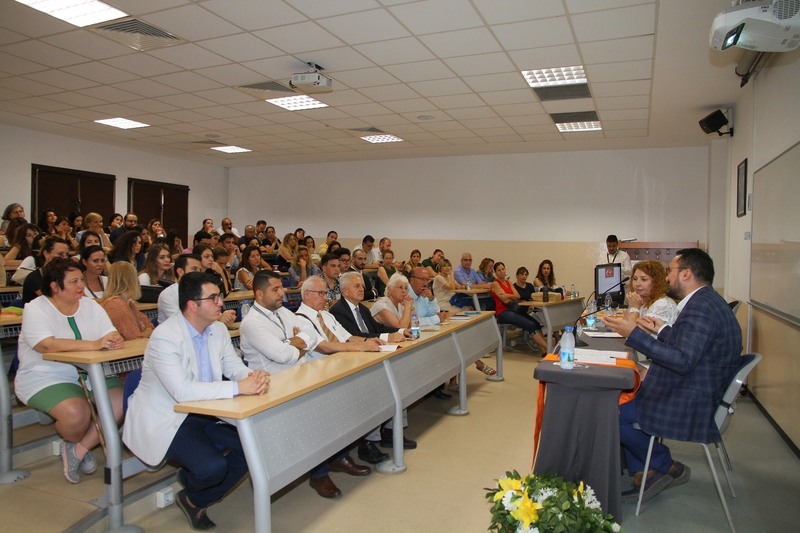 Within the scope of July 15th Democracy and National Unity Day, a talk on Historical Development of Democracy was held at Izmir University of Economics. Selami Özpoyraz, Chairman of the Assembly of Izmir Chamber of Commerce, IUE Rector Prof. Dr. Can Muğan and a large number of academicians and students attended the talk. IUE Vice Rector Prof. Dr. Filiz Başkan, Asst. Prof. Dr. Serkan Yolcu, member of Faculty of Law and Buğra Kaan Günay, President of Student Council spoke on the development of democracy from past to present. IUE Vice Rector Prof. Dr. Filiz Başkan indicated that democracy did not emerge instantly rather it has developed gradually, ant the term has a profound history. Dr. Başkan stated, “We can observe that the democratization process has never been a unilateral process since its commencement. During the specific periods, inverse waves against to democracy emerged in specific periods. During the first wave of democracy, democratic institutions were established in more than thirty countries in 19th century. However, in the first inverse wave period (1922-1942), fascism in Germany and Italy began to rise and Portugal and some Latin American countries faced military coups. West Germany, Italy, Japan and same third world countries were democratized during the second wave between 1943 and 1962. However, during the second inverse wave between 1958 and 1975, military coups in Latin American countries adversely affected the democratization. In the third wave, after 1974, Southern European countries, Latin American countries and Asian and Eastern European countries were democratized. Stating that democracy was protected on July 15, Dr. Başkan said, “In order to establish democracy in a country, there has to be mutual respect for different opinions, choices and beliefs; citizenship awareness needs to be raised and strong non-governmental organizations needs to be established since political parties are not adequate mechanisms for civil participation. Asst. Prof. Dr. Serkan Yolcu, member of Faculty of Law emphasized that democratic regime was seen also in primitive societies and added too and stated that an egalitarian structure dominated these societies even in the absence of a state. Yolcu expressed the great benefit of talking on democracy, and said, "We see the first example of a direct democracy in Athens in history. There existed a form of government in which people were directly involved in the process, without the intervention of representatives. In this sense of democracy, state is not seen as a different entity from citizens. Pursuant to the constitutionalizing of the power struggle at the end of 18th century, the constitution is intertwined with separation of powers. Democracy is the rule of majority, but it should protect the rights of minorities too. Fundamental rights and freedoms can only be secured through constitution. It is important to establish a balance between constitutionalism and democracy. Democracy as a form of government presupposes the choice. Democracy and constitutionalism complement each other. Democracy is a rational concept that will steer people towards the good." 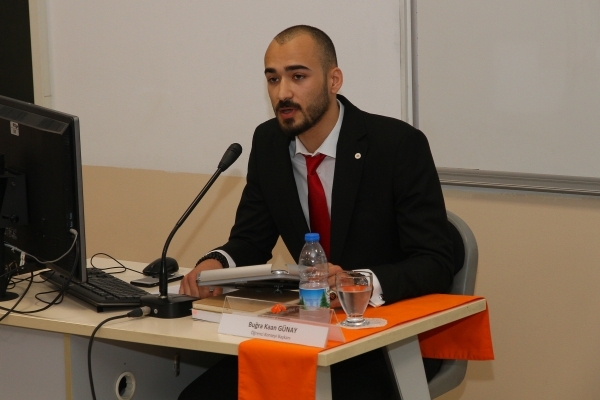 Buğra Kaan Günay, President of the IUE Student Council, stated that as Turkish youth their ultimate duty is to acquire knowledge, science and ethics and then protect Turkish state and nation. Günay stated, “We should stand united to protect our country, our state and our nation, not to face another 15th July tragedy, and not to lose our children, our land and our traditions. We should share our inner light and stand as one without division.